I blog for many reasons. One of the most important is to connect and have conversations with other people who are eager to discuss not only techniques, but also ideas and adventures. Letting you know this has been rolling round my head for weeks now. I'm so excited that reading other blog posts has inspired me to share! Product Camp. UnConference Methodology at it's finest! source: bottom of page. I recently read Sigrid's post about meeting up with Renee from Miss Celie's Pants at a dreamy fabric store called Kantje Boord in Amsterdam. First of all, I just adored how Renee hugged the bolts of laces. What fun it must have been for a meet up of sewing bloggers?! And to meet each of these ladies would have been crazy wild fun... think of the brainstorming and inspiration session that could have taken place. Wild. I love to brainstorm. I love to discuss possibilities and ideas. Secondly, I've been to the Netherlands (almost 10 years ago) and loved it. Fascinated. The women wore mini skirts and stiletto boots and cycled with umbrellas in hand in cold and rainy November. Mind blowing. I did buy fabric in Eindhoven (oh God I was figuring out meter to yard conversions on the fly), picked up some cool vintage trims, the cutest stove top espresso maker, and fun bicycle bags at Kitsch Kitchen in the Jordaan district of Amsterdam. Travel definitely enriches the fabric of our lives. Catching up on Renee's Cycling Sport Dress post (travel & athletic wear? I'm intrigued! ), I followed a link to Sewing Artistry and fell in love with her cycling gear. Aren't those bicycles scatter printed just a hoot?! So my dear new idea friend, Claire, and you my dear reader friends, I share my further ponderings on her excellent topic of Fashion in the Age of the Cheap. We only make change when we "vote with our feet" as I learned in the principles of the un-conference and product camp. Our recent losses of shops and businesses make it clear that where we spend time & money is what we keep alive. While I'm sad to see many leave, I'm also grateful for how clear an example they have shown of the importance our individual vote or dollar has. So many haven't chosen certain things because they felt their vote or dollar didn't really count amongst the sea of others. Well, it does and it did. You touch on subjects that run very close to home. I love how everyone is refocusing to make as many conscious choices as they can. It's not easy, but worth it. I wonder, could the focus on fast & cheap fashion could be considered an outlet that is needed for "thrill" category. How much do we need to be thrilled? How much do we need to keep being inspired? Or, are we happier when we have fewer thrills and get to glorify them and tell stories of their greatness. I haven't the answer, but your comments about how we wouldn't treat food or homes or computers the same way as food got me wondering if we value clothing so much less and that we can bring to market so much faster and cheaper (in some ways) than in past, that it became an easy target. What are your thoughts on Fashion in the Age of the Cheap and the need for a "Thrill" in our lives? Are you choosing to live differently and consume less? 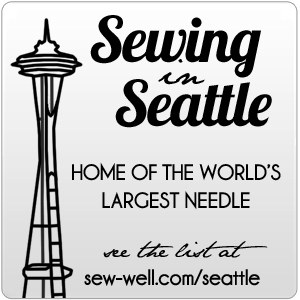 Does that impact your sewing? I'd love to read your comments.